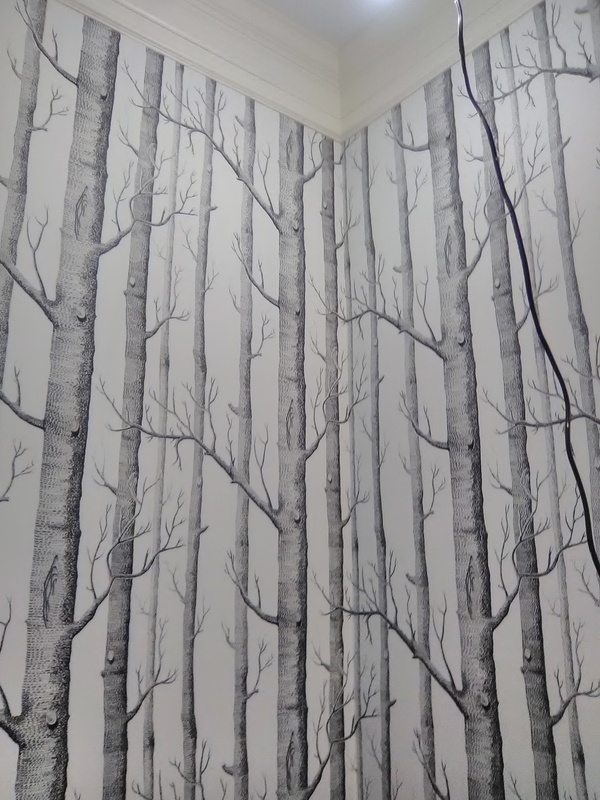 It was hard getting a full-wall shot of this wallpaper install, because the wall was so darned tall – nearly 12 feet high! But you get the idea. 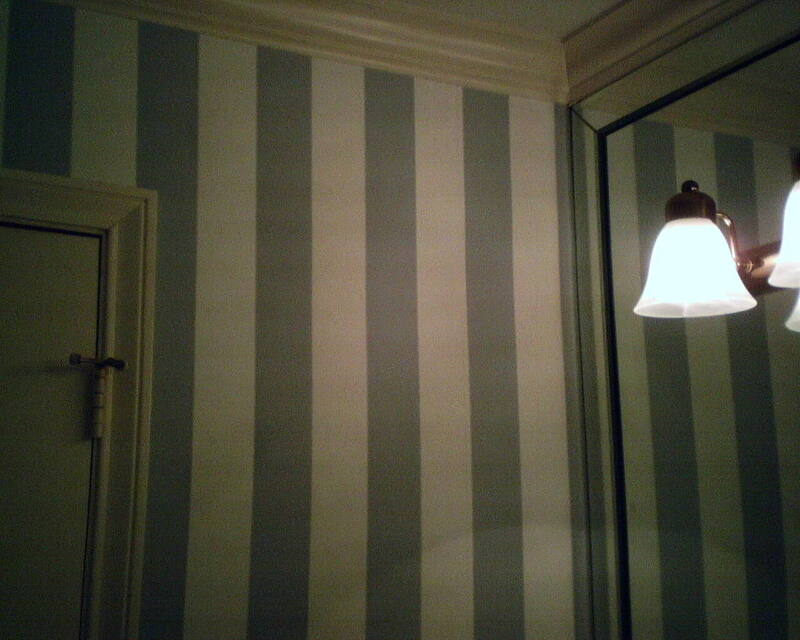 Originally, the wall was painted navy blue, like the other three walls in this master bedroom. The wall also had a flat-screen TV plastered in the middle of it. The husband, of course, loved the huge TV. 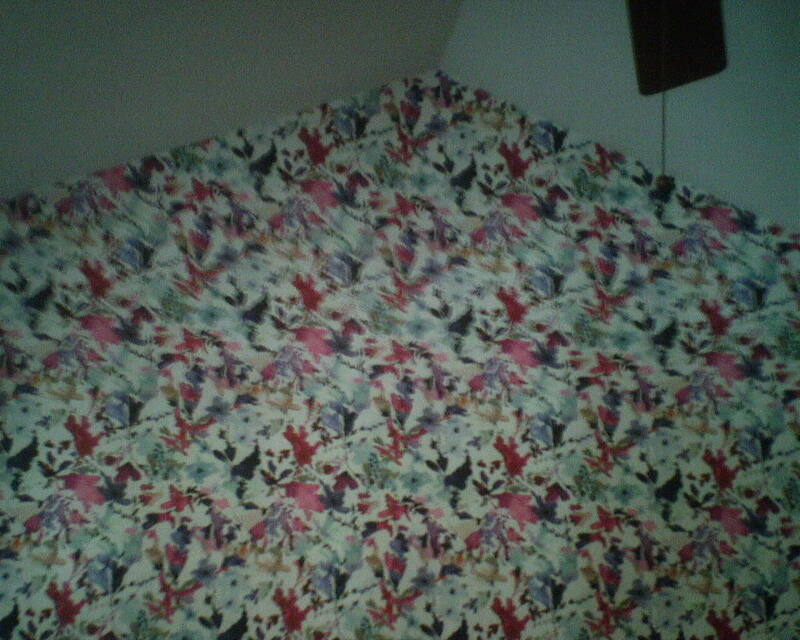 But the wife persevered, and got him to agree to have this colorful and playful wallpaper cover the wall. 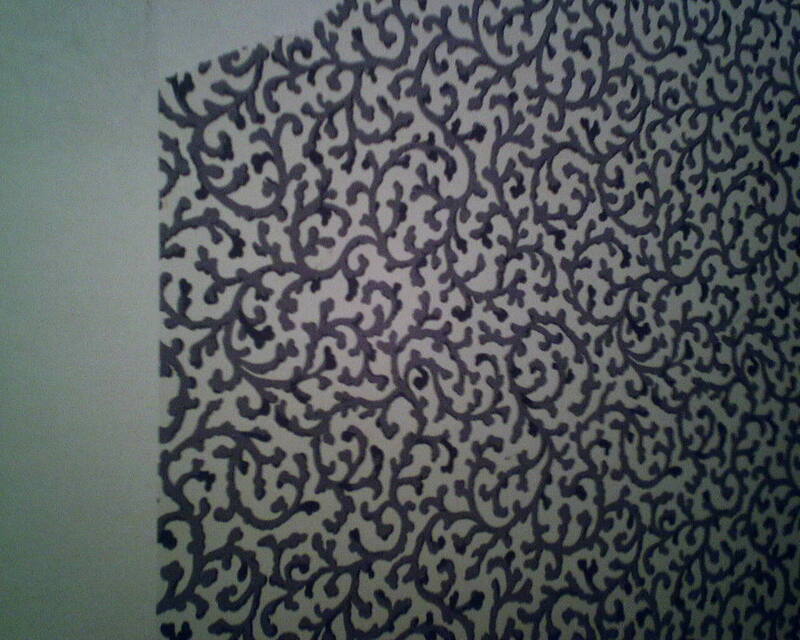 Now, as to whether or not that TV will go back up on the wall remains to be seen …. 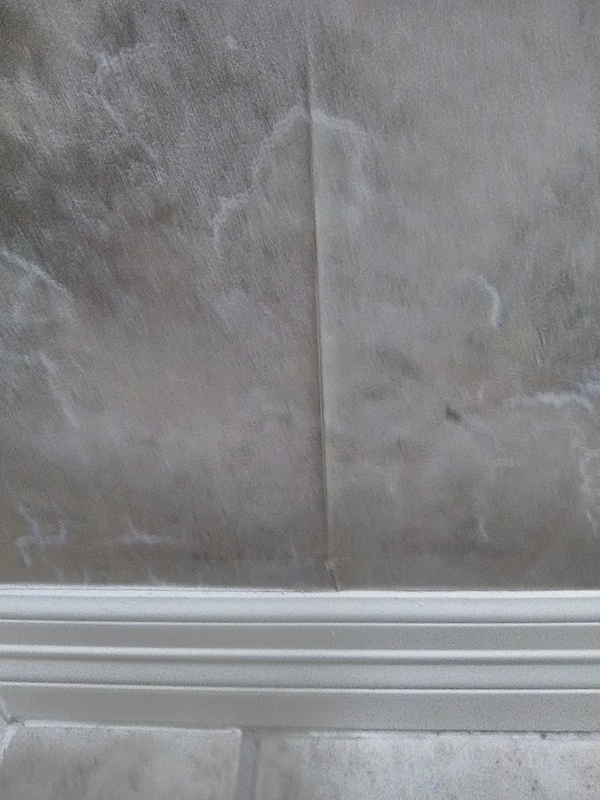 I smoothed the textured wall, which you can see on the right side of the first photo. 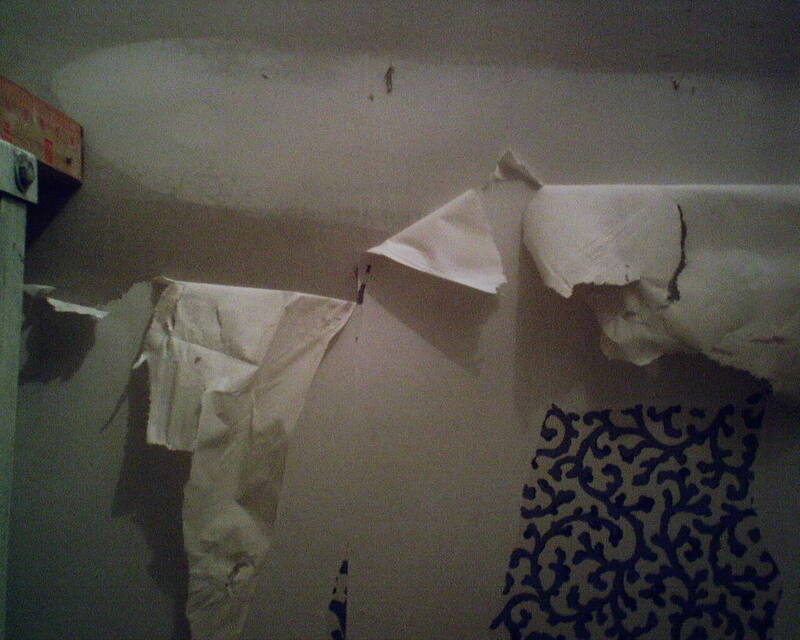 The next day I hung the paper. 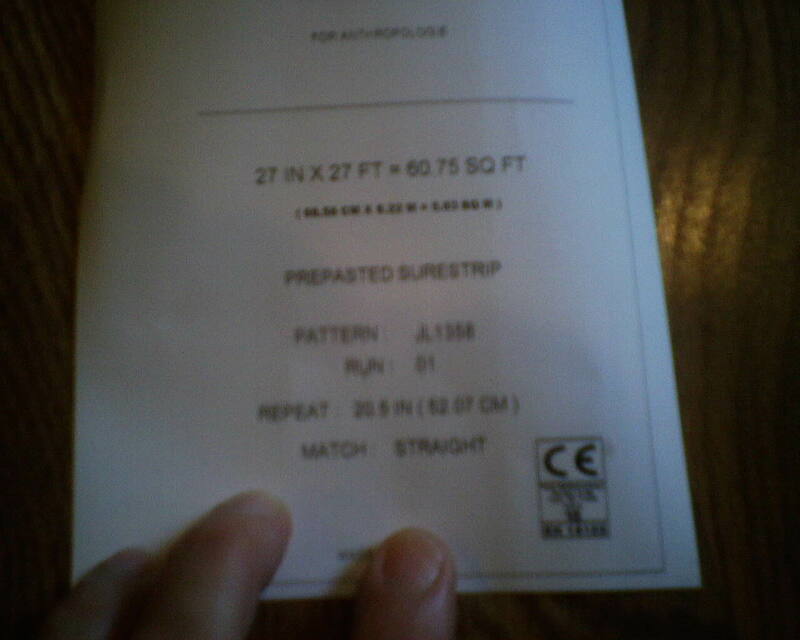 The paper is by York, in the SureStrip line. 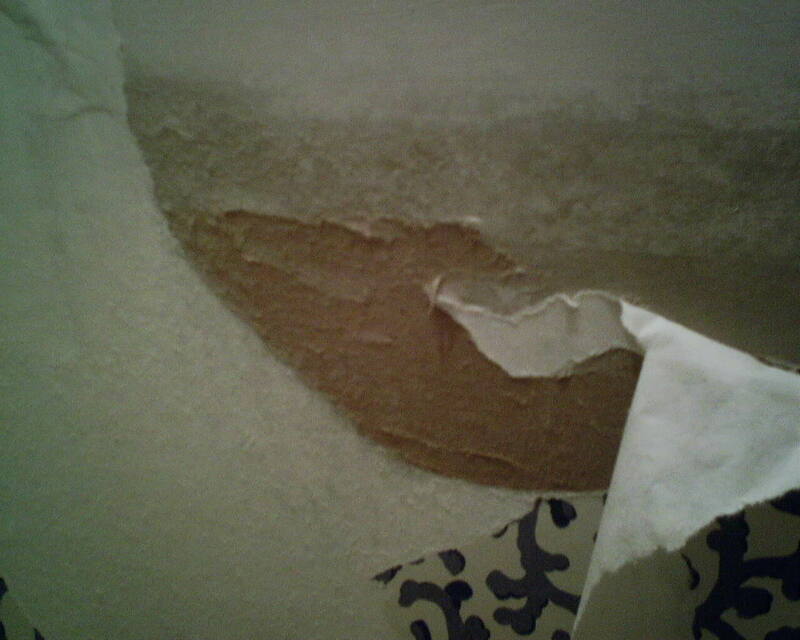 It is a pre-pasted product, on a thin non-woven backing, and is designed to strip off the wall (relatively) easily when you want to redecorate. It is a lovely product to work with, clings tightly to the wall, seams are nearly invisible, and should hold up nicely for many years. This is a 1955 home with mid-century modern flare, in the Spring Branch neighborhood of Houston, and the clients were a busy family with school-age children. Good-Bye Super Sweet, Hello … Well, the New Pattern is Sweet, Too. 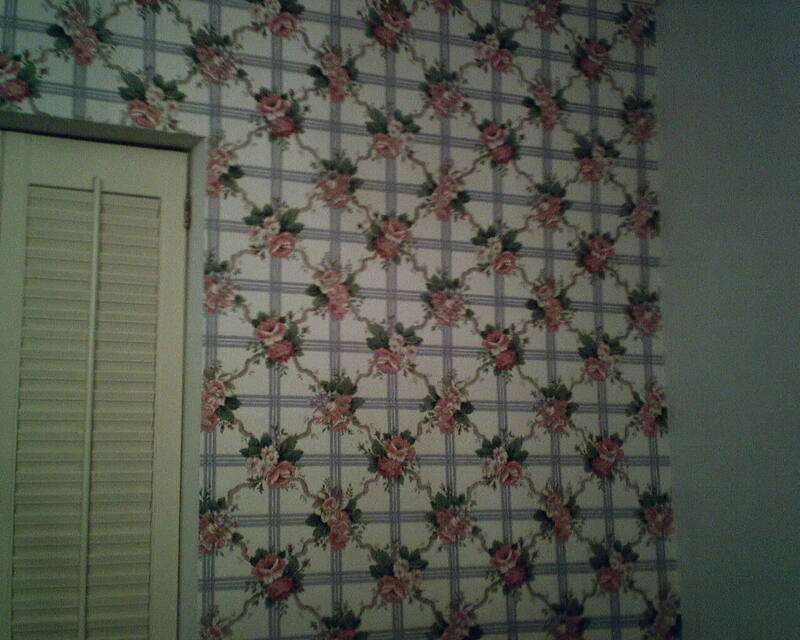 Everything in this house – EVERYTHING – is pink, red, navy, and baby blue, all cabbage roses, china, and Waverly style. 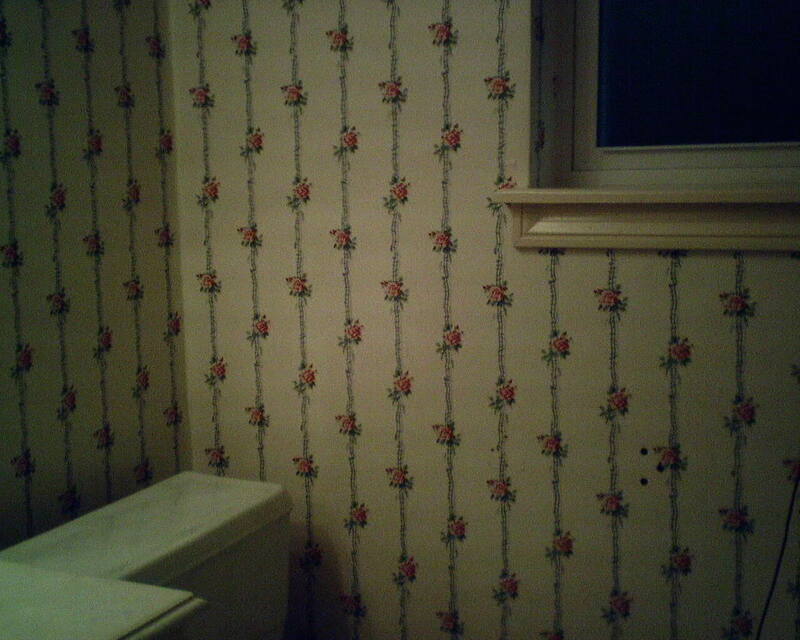 This matches the homeowner’s personality, as she is a very sweet lady. 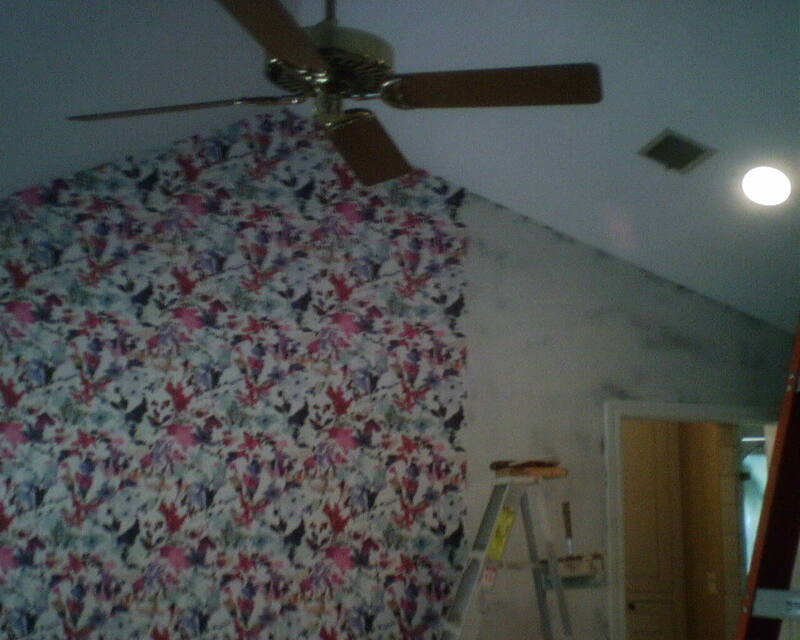 But she was getting tired of all the pattern, as you see in the top two photos (master bathroom and sitting room). Gee, it had been up since the ’90’s! And I hung a lot of that style in those years. 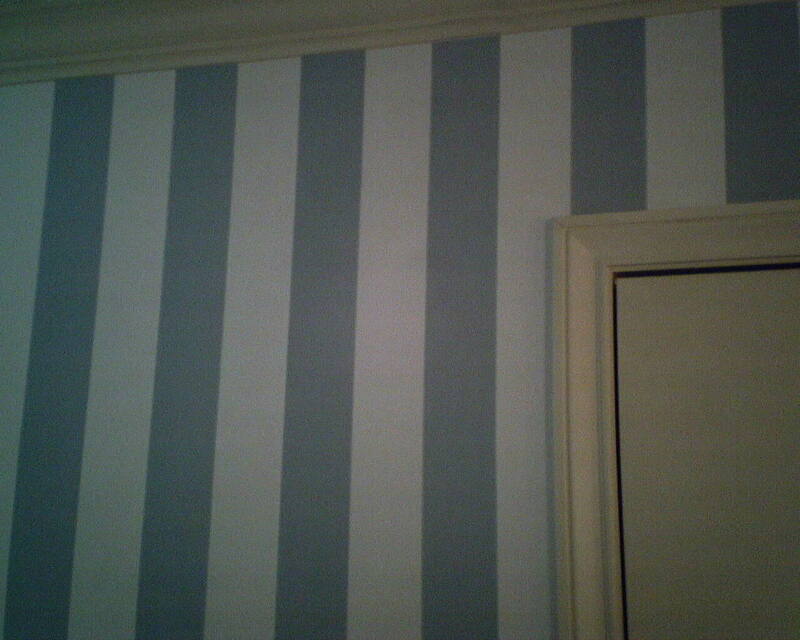 So she had me strip off the flowery paper (see yesterday’s blog post), and rehang the bathroom with this 3″ baby blue-on-white stripe. The wide stripes in pastel blue are a good fit for the room, as anything narrower or darker could have looked jail housey. 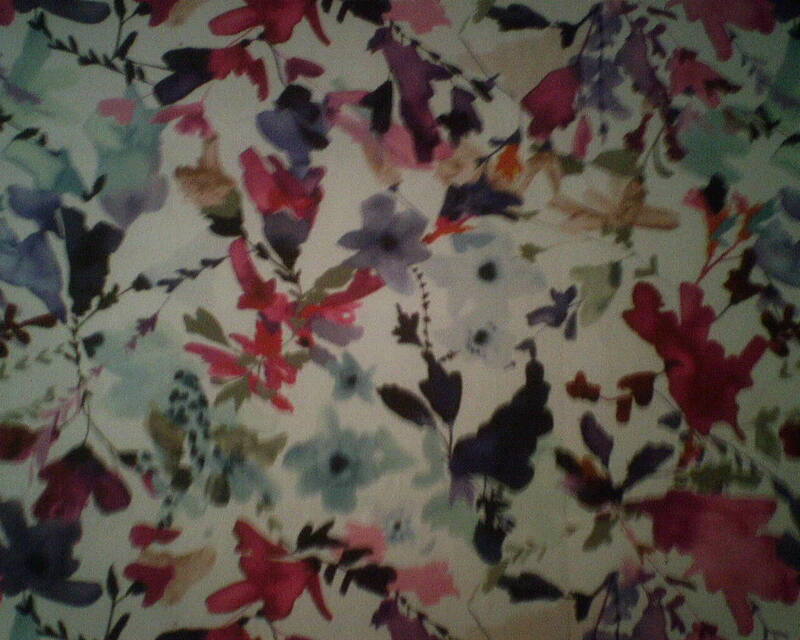 It’s still a sweet look, but it’s much softer than the deep hues and busy patterns. 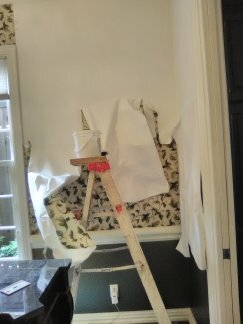 The sitting room wall was left unpapered, and her handy man will paint it this weekend. 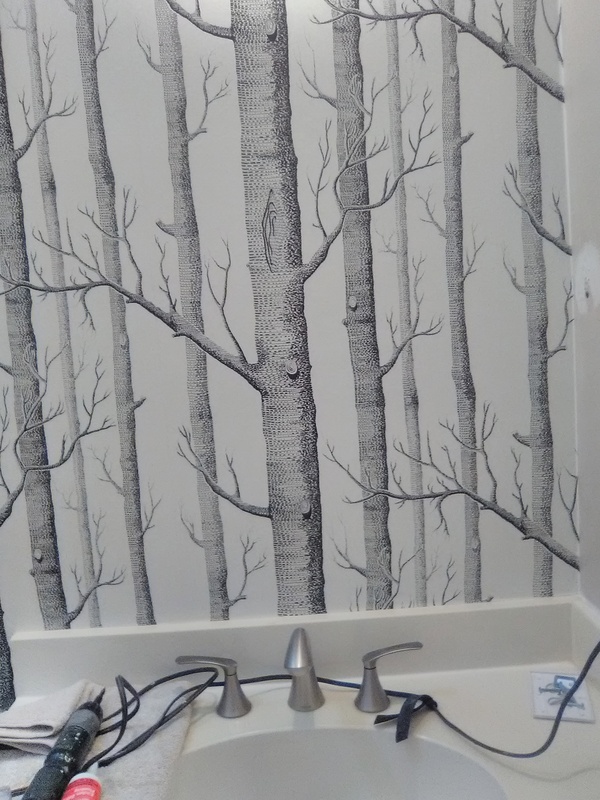 This wallpaper is by Sure-Strip, a reasonably-priced, prepasted paper that is designed to come off the wall later with minimal effort. 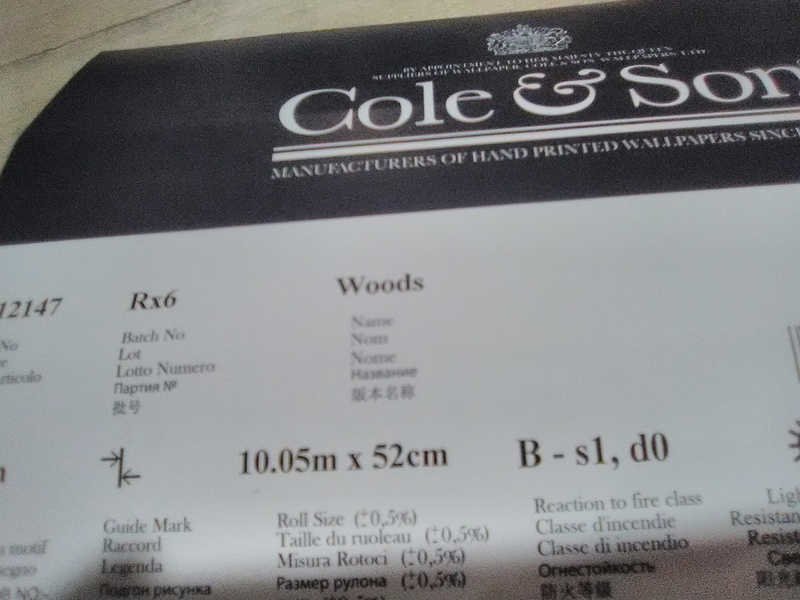 I enjoy working with this brand, and it performs nicely over time. The paper was bought at a discounted price from Dorota Hartwig at Southwestern Paint on Bissonnet near Kirby. (713) 520-6262 or dorotasouthwestern@hotmail.com. Discuss your project and make an appointment before heading over to see her.